It's finals week so the stress to finish the semester strong is on. Last thing I need now is to repeat any courses. I'm getting ever more excited to start my next RPG in January, but Dragon Souls needs to exist first. Not only is it going to lock-down the trademark I paid so much for, but it's grid system will be used in my next game's overworld. It's also supposed to show how I have plans for future games that don't all involve multicolored equines. This game just needs to be out. By the looks of things I won't be making the December 22nd deadline, but who knows. Maybe I'll be really productive over winter break. Get some sales data, convention plans, and other news below. If any devs out there know how to get past this, please help. This forum has decreased my hope. 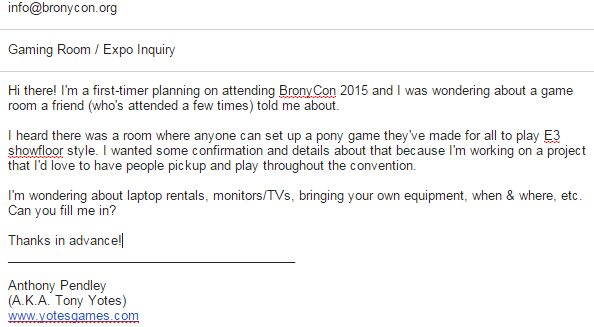 BronyCon 2015 happens August 7th and panel submissions are due in February. I need to start planning to see if it's a feasible thing to do. My parents are behind me on it since this could be a great opportunity for me career-wise, but I'm eager to experience showing my games to crowds of interested strangers. I'm getting wheels turning to see if I can get involved in 3 activities to make the most out of this trip. A panel showing of my turn-based RPG, a panel with other devs talking about how we got started, and having a playable demo of my game out PAX East style. In game sales news, I'm eagerly awaiting my very first payday. according to the monthly sales report I earned about $315 for the month of November 2014 and should expect a pending deposit from Google on the 15th. It'll be a huge morale boost to see numbers in my bank account approaching the $1100 I need to buy a Macbook and $500 I need to become an LLC. Becoming an LLC can wait as I won't need it until I move with my parents to Florida this July (I'll be flying back to Pennsylvania to finish my senior year at school). With Florida's lack of corporate tax and my parents living near enough to support me should things go wrong, I should be in a good spot for starting up my gamedev business. I'll be right next to Georgia's Art Institute and Full Sail for potential recruits and I can enjoy winter weather that isn't awful! Moving to Florida has always been on the agenda, but my parents surprised me with the news over Thanksgiving break and I'll need to take this stuff into account for my master plan of becoming an indie straight out of college. The Unicorn Training demo reached 3165 across all android platforms and the full version got to 546 this week. I go to sleep smiling because I can finally say there's a cool game to my name that people are willing to pay for. The daily numbers went down to 10 a day while some of my other apps are getting attention just by being in the "More From This Developer" list. I wonder if Dragon Souls Prologue will help boost up Unicorn Training a bit. How popular can I get in the free action game category? 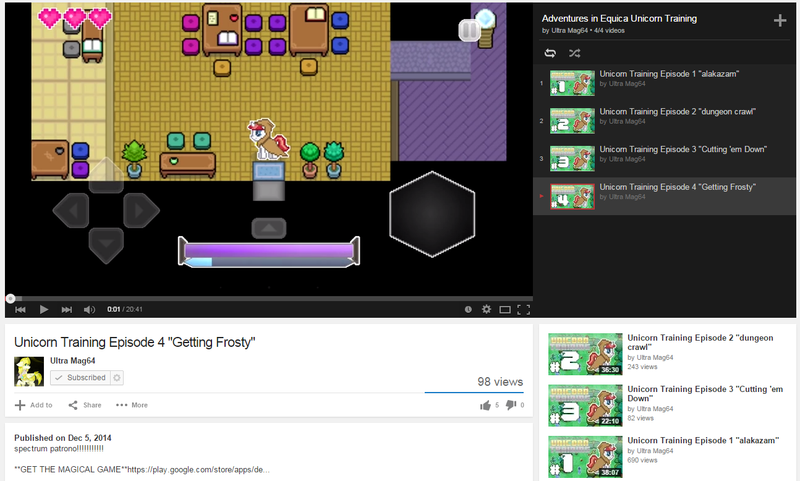 A Let's Play of Unicorn Training is on it's 4th episode. With all the glitches popping up post-launch I'm hoping part 5 is bug free. I'm way off the top 10 lists now and I think this is where Unicorn Training is going to sit for a while. The launch frenzy is done and all hat's left are player recommendations and the lasting impression the game made. Unfortunately the launch week bugs turned a lot of people away and some game design decisions bring down the overall quality. Unicorn Training is recognized as a novice developer's game as it truly is. It's up to me now to prove that I am getting better at this by releasing something truly impressive. 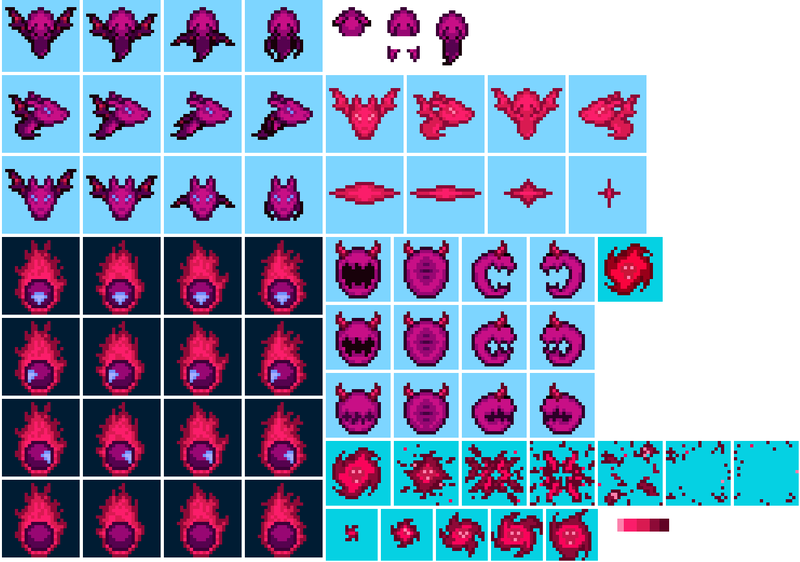 I'm hoping to get a lot of sprite work done between finals. It's a nice activity for relaxing my mind while listening to podcasts. I'm going to need a lot of relaxation if I'm going to survive these self-imposed deadlines and the ridiculous amount of things to memorize for college exams.